The RST Profilence range of water saving shower roses are specifically designed for fixed head showers that enable, by means of a patented turbo ﬂow system, the greatest possible water and energy savings combined with sufficient water pressure. 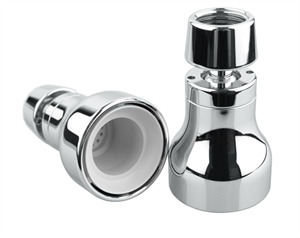 The RST Profilence VP is provided with a ball-joint which enables the shower head to swivel at an angle of 26 degrees. The RST Profilence Fix does not have a ball joint and therefore can’t be manipulated which makes it ideal for use in vandalised areas. This turbulent ﬂow system, which separates the stream of water into thousands of high-pressure droplets, provides many advantages and to mention just one – it prevents the build-up of lime-scale. The patented isoﬂow® ﬂow-rate control technology maintains a constant water ﬂow, independent of water pressure. 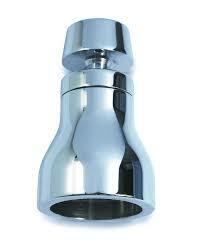 The water ﬂow can be set to 10 l/min, 8 l/min or 7 l/min depending on the required application. Constructed with lead free DZR brass and plated with chrome. The inner workings and 12 hole aeration plates are made from Teflon. They are manufactured in Germany. The unit uses the standard thread for shower heads and should be an easy task of removing the old and twisting on the new. The shower rose has a special tool which must be used for installing and removing the showerhead, or to open it for maintenance. This helps to prevent theft and vandalism. 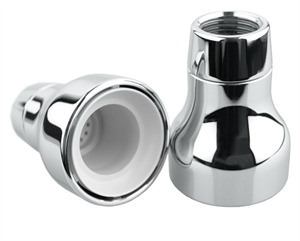 Editor: I have tried various shower heads, and this RST range has been by far the best in water saving as well as providing a sufficient water pressure. Don’t drop it on your foot while installing, they are solid brass.